Liao Yiwu is a Chinese dissident who was imprisoned for 4 years after writing a poem about the Tiananmen Square Massacre. In spite of his continued monitoring by Chinese officials he is still active and writing. This book was written and smuggled out of China for publication. The translation is by Wen Huang. It is a most interesting book as it takes some of the occupations and trades that were banned by the Chinese Government and explores how these prohibitions affected the Chinese people through the years of Mao Tse Tung and beyond. There are 27 professions examined through interviews with the members of China’s “forgotten classes”. Liao Yiwu asks the questions and the subjects let go with a “no holds barred” account of their lives and professions. Here we have the Corpse Walker- an ancient art, whereby the corpse is “walked” to the funeral. The practice was banned as being superstitious. 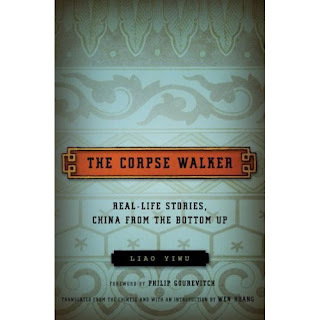 The “walkers” interviewed here tell the history of the profession and explain why they continue with the practice and what it meant to Chinese culture. The Public Rest Room Attendant- a former landlord before his re-education- gives us his views on the “new” China and where it is heading. He sees all manner of people in his profession- toilets, you see, are the real equalizers in all societies. From the Feng Shui practioner , Blind Street Musician and on to the Human Trafficker and Falon Gong member this is a unique perspective of where China has been, where it is, and where it may be heading. With a keen eye and a writers wit Mr. Liao has painted a portrait of China that is both a history and a narrative of a land that has always fascinated me.